In the final throes of preparing for this semester, while digging though some readings for a class, I came across a small booklet that I collected a few years ago. I can’t remember exactly where, but it was certainly from an antique store in some small town. 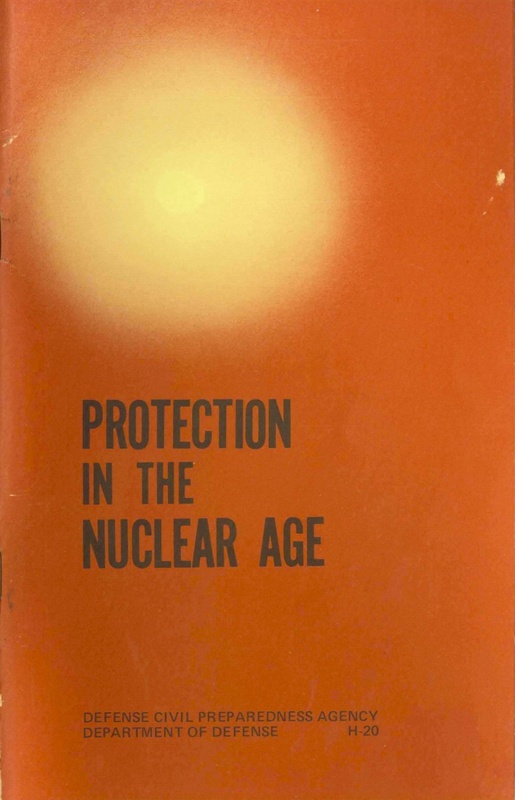 Published by the Defense Civil Preparedness Agency of the US Department of Defense, Protection in the Nuclear Age, is an interesting gimpse at a time that now seems very much more remote and alien than the 1977 publication date suggests. Its eight chapters summarize the nature of a nuclear attack, how to increase chances of survival through the use or creation of a fallout shelter, what life would be like after an attack and how to avoid various hazards. It includes numerous illustrations, preparedness lists and extensive lists of supplies. The text clearly suggests, however, that public shelters—with the advantages of centralized management, designated trouble shooters and enough supplies—are preferable to home shelters where “you and your family would largely be on your own.” Safety and survival depend on others. Individuals are only referenced as part of social groups and communities. The booklet seemed too interesting not to share, so the link in the first paragraph goes to a full-color PDF of the booklet. Be Prepared! The US government distributed this book to elementary school kids during the Carter administration.